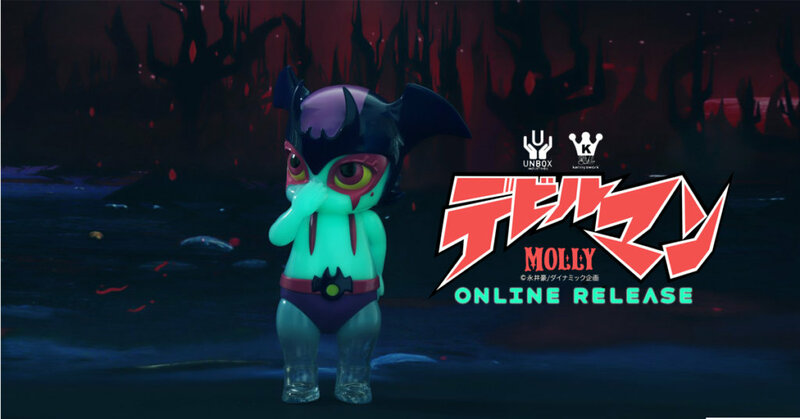 Great news coming in if you are looking for DEVILMOLLY by Kenny Wong x Go Nagai x Unbox Industries and couldn’t make it to the Asian conventions and pop-up shows. Like we said previously, Kenny Wong’s Molly gone into extream cosplay mode, never did we think Devilman look so cute! Kennyswork x Unbox Industries power up the much loved Molly. Kennyswork and Unbox Industries utilising the Devilman licence to bring you a GLOW IN THE DARK “Devilmolly”. In true Devilman colours, with a spruce of GID to light up your display. Unbox are proud to offer our latest release with the legendary Go Nagai! We are thrilled to have Kenny Wong onboard with this project as he turns his hand (with the aid of Molly of course!) to creating the cutest Devilman we have ever seen. This is the first in a series of Kenny Wong and Go Nagai projects, keep you eyes peeled for more amazing work soon!